Dolores De Rosa was born on August 15,1923 in Chicago, Illinois to Edward and Flossie Mae (nee Beeman) Smith. She died Sunday, April 7, 2019 at her home. Mrs. De Rosa was a homemaker who cherished her family and enjoyed dancing, music, attending her family’s performances and socializing. She was a quiet and courageous woman who led by example. She was a member of Our Lady of the Wayside Catholic Church and Eucharistic Ministry, Northwest Community Hospital Eucharistic Ministry, the Arlington Heights Senior Center Advisory and Events Councils, and the 793RD Military Police BN Association. 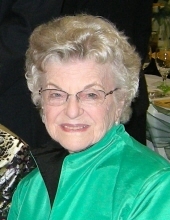 Her interests and hobbies included reading, costuming, iPad solitaire, crossword puzzles and sewing. great grandchildren Trever, Joey, Ainsley, Adison, Naomi, Parker, Bennett, Maddox, Henry, Emmy, Lily, Sophie Rose and Jack Robert; her sister-in-law Jackie; she was also survived by many nieces and nephews. She was preceded in death by Frank Robert De Rosa, her husband of sixty-seven years and her parents as well as five siblings. Visitation Thursday, April 11, 2019 from 3:00pm until 8:00pm at Glueckert Funeral Home Ltd., 1520 N. Arlington Heights Rd., Arlington Heights, IL 60004 and on Friday, April 12, 2019 from 8:30am until time of Funeral Mass at 9:30am at Our Lady of the Wayside Catholic Church, 440 S. Mitchell, Arlington Heights, Illinois. Interment will be private. "Email Address" would like to share the life celebration of Dolores B. De Rosa. Click on the "link" to go to share a favorite memory or leave a condolence message for the family.